A tasuki fuseki (or diagonal fuseki; cf. 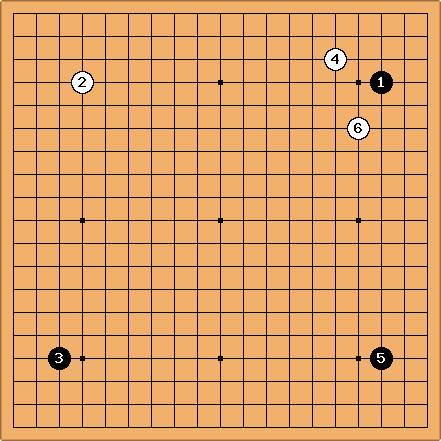 parallel fuseki) is one in which both players make their initial plays in diagonally opposite empty corners. This dispersal of the strength of each player's initial stones is thought to give rise to close-fought games. 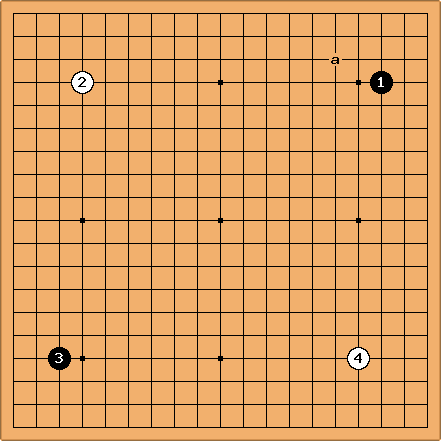 Well known examples include the regulation fuseki and cross hoshi; see also opposing 3-4 points. The pushing battle and counter-pincer joseki family becomes important for diagonal fuseki. When Black plays 1 at komoku (3-4 point), White plays 2 in the adjacent corner facing B's open position, perhaps intending to use 2 to support an approach move at 'a' shortly. B now has the opportunity to play in the diagonally opposite corner from 1 (at 3 or another point close by). If W now plays at or around 4, the result is a tasuki fuseki. The term tasuki, meaning "sash", is analogous to the kimono sash worn crossed diagonally across the body.